When someone is making north of $30 million, logic seems to exit the minds of fans who think it’s simply a physical injury that needs recovery time. When in reality, the mental aspect of it far exceeds the physical tension and stress that weighs on an ankle that got horrifically snapped on Opening Night in 2017. But for Gordon Hayward, it seems he has put all of those struggles in the rearview mirror and gotten back to the player he used to be. While still lacking some of the explosiveness that had him so coveted on the free agent market two years ago, Hayward has averaged 16.4 points, six rebounds, and three assists per game over his last eight. All while shooting 58.5 percent from the floor and averaging just shy of 30 minutes a night. And it couldn’t have come at a better time for the Celtics, who have just one game left before they take on the Indiana Pacers in Game 1 of the Eastern Conference Quarterfinals. While everyone knows the elite performer in clutch situations that is Kyrie Irving, and how much Jaylen Brown, Jayson Tatum, and Al Horford can rise to the occasion in a big game, it’ll be the success of No. 20 that determines just how far the Celtics make it in the postseason. In Boston, the mindset of fans and the media is “So what? What have you done for me lately?” Well, for Gordon Hayward, he’s done nothing but give people reasons to believe that he has found the confidence in himself and in his ankle to perform at a high level each and every night. 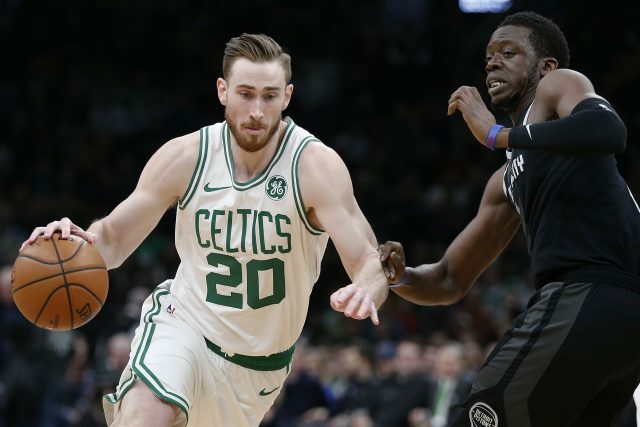 Celtics fans should be confident rolling into Game 1 at TD Garden that the home team will finally have a Gordon Hayward that is fully confident in his ability to go out there and play at a high level. Because that’s the player he is. A max player. There’s a reason why he got the money he was paid in the summer of 2017, and you’re watching it unfold right before your eyes as the playoffs draw closer by the second.